Hitting out at the AIADMK for its “wrong approach” in handling the Cauvery waters issue, DMK President M. Karunanidhi said today that his party would take up the issue with Prime Minister Atal Behari Vajpayee on his return from the tour of Maldives. The Supreme Court is likely to take up for hearing tomorrow the contempt petition filed by the Tamil Nadu Government against Karnataka for its alleged failure to implement the court’s order on release of Cauvery wakers to the state. People’s Democratic Freedom Party’s chief Shabir Shah met the Kashmir Committee last night and conveyed to it that his party would not campaign for a poll boycott in the ongoing Jammu and Kashmir elections. The Madhya Pradesh Government will move the Supreme Court with a prayer that the Union Carbide Corporation, now amalgamated with Dow Chemical Company, be directed to remove chemical waste dumped on the premises of the erstwhile pesticide factory which had witnessed the world’s biggest industrial disaster in December 1984. Prominent Muslim leaders have urged the district administration to undertake the counting of exact number of Muslim graveyards and repair old mosques numbering at least 57 in the temple town. Five persons, including two UAE officials, were killed in a helicopter crash near Ambawade village in the Mulshi taluka of this district here today. An idol maker from West Bengal works on a representation of the Hindu Goddess Durga in his workshop in Bhopal, on Sunday. An annual five-day Durga Puja festival will take place in autumn across the country and is one of the most popular Hindu festivals. In Hindu mythology, Durga symbolises power and the triumph of good over evil. He first made headlines when as a crusading Municipal Commissioner in this city he took on politicians and builders and paid with his job. Mr Arun Bhatia, unceremoniously shunted out of the municipality to the Tribal Research and Training Institute, is back in the news — for blaming malnutrition for the death of 122 tribal children in Maharashtra’s Thane and Nandurbar districts. Terming the allegations levelled by singer Hans Raj Hans as baseless, Super Cassettes Industries, director, Bhushan Kumar has denied making any threats to the singer. 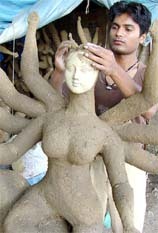 A Puja committee in Kolkata prepares pandals out of bidis to be the centre of attraction this year. Speaking to newspersons at the party headquarters here, Mr Karunanidhi, former Tamil Nadu Chief Minister, denied that his party had adopted a “different approach” by boycotting the all-party meeting and not joining the delegation to Delhi. “Our stand is that Chief Minister Jayalalithaa had not adopted a proper approach from the beginning. She should have either gone for talks or approached the court. By taking both roads and demanding the dismissal of the Karnataka Government, she has incurred the wrath of Karnataka people”. Taking exception to Ms Jayalalithaa’s criticism that he was not interested in the Cauvery issue as he did not hail from a family of agriculturists, Mr Karunanidhi said he had handled the issue right from 1968 when he was appointed by the late C.N. Annadurai as Public Works Minister. “None can belittle or underestimate my concern on the issue”, he said. Referring to Ms Jayalalithaa’s allegation that none of the 10 ministers in the Central Cabinet from Tamil Nadu had done anything on the Cauvery waters issue, Mr Karunanidhi said it was because she (Ms Jayalalithaa) never took them into confidence. Pointing out that Karnataka Chief Minister S.M. 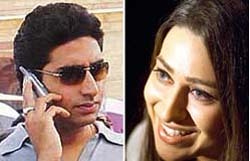 Krishna consulted even his predecessors, like K. Kamaraj and M. Bhaktavatsalam, Mr Karunanidhi asked, “Did she at least contact me on the phone?”. The Prime Minister had yesterday directed Karnataka to release water only on the basis of the telex message and letter from the DMK party, he claimed. HYDERABAD: In a bid to overcome the severe drought situation and shortage of drinking water, the Andhra Pradesh government is planning to seek water from Karnataka where “the water in the Almatti dam has not been put to full use”. The court had last week fixed hearing on Tamil Nadu’s petition for the release of 1.25 tmcft water to the state by Karnataka as directed by the court in its offer on September 3, which was subsequently reduced by Cauvery River Authority (CRA) to 0.8 tmcft. The Tamil Nadu Government alleged that despite the apex court’s September 3 order for releasing 1.25 tmcft of Cauvery river water per day by Karnataka to Mettur reservoir in Tamil Nadu and CRA fixing it at 0.8 cft per day from September 9, the directions were not fully complied with. Tamil Nadu claimed that little over 4 tmcft of water has been released by Karnataka so far. The petition said the total quantum by now should have been more than 10 tmcft. Karnataka in its affidavit submitted that if it continued to release 0.8 tmcft of Cauvery water to Tamil Nadu, its reservoirs would exhaust in 45 days. It said Karnataka had not “willfully disobeyed” the court order and had released 8.2 tmcft water between September 4 and September 18. Seeking to initiate contempt of court proceedings against the Karnataka Government, Tamil Nadu in its petition has named Karnataka Chief Minister S M Krishna, State’s Water Resource Minister H K Patil, Chief Secretary and two engineers concerned as respondents. People’s Democratic Freedom Party’s (PDFP) chief Shabir Shah met the Kashmir Committee last night and conveyed to it that his party would not campaign for a poll boycott in the ongoing Jammu and Kashmir elections. Mr Shah discussed with Mr Ram Jethmalani, chief of the Kashmir Committee, and its other members, the political developments in the state. Sources said the PDFP indicated that it would not create obstacles or call upon voters to abstain from exercising their right to franchise. However, Mr Shah emphasised that elections were not the objective of his party which was primarily working for achieving a lasting solution to the Kashmir problem. During his two-hour meeting, Mr Shah also discussed measures for carrying further the dialogue process so that peace was achieved in the region. This was Mr Shah’s third round of talks with the Kashmir Committee members in the past one month. Mr Jethmalani, who was assisted at the talks by Mr Dileep Padgaonkar, Mr V.K. Grover and Mr Ashok Bhan, briefed Mr Shah about the committee’s discussions so far. Mr Padgaonkar had two rounds of talks with Mr Ashraf Jehangir Qazi, Pakistan’s Ambassador to the USA in New York recently. Mr Qazi conveyed General Musharraf’s appreciation of the committee’s efforts. This was decided at a meeting of the Advisory Committee on Gas Relief and Rehabilitation last evening. Chief Minister Digvijay Singh, who heads the committee, presided. The Chief Minister stressed the urgency in the matter in order to protect environment and slum dwellers living around the factory premises. He said the removal of the chemical wastes was the sole responsibility of Union Carbide and it should be asked to bear the expenditure on the exercise. Voluntary organisations working among the gas victims have for years been crying hoarse about the wastes and their deleterious effect on the people living around the factory site, but they have never had a sympathetic ear from the Chief Minister so far. The toxic chemical wastes are estimated at 10,000 metric tonnes. According to Bhopal Gas Peedit Mahila Udyog Sangathan convener Abdul Jabbar, the wastes, spread over an area of 22 acres, are seeping into groundwater and creating health hazards in localities like Nawab Colony, Annu Nagar and Kainchi Chhola, where the residents have to depend on hand pumps for drinking water. An analysis of samples of soil and water by the Citizens Environmental Laboratory (CEL), Boston, USA, in 1990 had detected the presence of benzene, oxybis, dicholorobenzenes, polynuclear aromatic hydrocarbons, phthlates, tricholorobenzenes, trimethyl triazintrione and 1-naphthalenol in various quantities. The samples were collected by the Bhopal Group for Information and Action from in and around the solar evaporation ponds of the plant and sent to the laboratory in Boston for analysis. Convener of Faizabad-Ayodhya Babri Masjid Action Committee Mohammad Yunus Siddeque here today said a delegation of the Muslim leaders had met the Commissioner R.M. Srivastava last evening and urged him to take necessary steps in this regard. “The condition of the old mosques in Ayodhya is very poor and they needed urgent repairs,” he said. The delegation included, among others, former MP and Convener of the Babri Masjid Movement Coordination Committee Syed Shahabuddin and Convener of the Helal Committee Mohammad Khalique. Mr Siddique said the Muslim leaders also held informal talks with the mahant of the Hanumangarhi temple Baba Gyan Das and one of the main plaintiffs in the Ram Janambhoomi-Babri Masjid title suits Haji Mohammad Hashim Ansari during their visit. Tension gripped the old city areas after a 58-year-old shopowner was stabbed in the Khanderao market here today. Shutters were downed after the incident and people ran helter-skelter, apprehending mob violence. The helicopter belonged to Raymond company, the rural police said while confirming the death of five persons. However, it was still not clear as to how many persons were on board, the police said. Lonvala police sources said the chopper, piloted by Captain Bhardwaj and Captain Malhotra, was to reach the Pawan Hans base at Juhu in North-West Mumbai between 2 and 3 pm, but lost contact with the base soon after it took off. Mr Advani, however, did not make any such remark straightway. But his recent observation on Kolkata , while inaugurating the trial run of the Delhi metro rail, was equally disdainful to the lovers of Kolkata. Mr Advani said he was delighted about Kolkata’s metro but not the city as such. Chief Minister Buddhadev Bhattacharjee’s reaction to Mr Advani’s observation is simple but curt : “It does not matter to me who likes the city or not but personally, I like it”, said the litterateur chief minister. But his minister in charge of Kolkata, Mr Ashok Bhattacharyya has been much virulent in his attack on Mr Advani calling him an irresponsible person. “Mr Advani’s observation about Kolkata has equalled him with Rajiv Gandhi and he should be happy about that", bantered the minister, adding he did not expect any better from Mr Advani’s saffronised mind. To Kolkata mayor, Subrata Mukheree, the deputy prime minister’s remark on Kolkata was shocking. Noted film-director Mrinal Sen says he is not surprised at Mr Advani’s remark. “Mr Advani must have made his observation with an eye on politics. After all, their political adversary has been in power in Bengal for so long a period at a stretch”, he remarked. Another renowned Bengali novelist, Manisankar Mukhopadhyya( pen name Sankar ), however, has reacted otherwise. He feels Mr Advani has come out with truths. “Who will deny Kolkata today is not what Calcutta had been in the past. And I am with Mr Advani in commending Kolkata’s metro rail and we are proud of the metro, he remarked. The Marxist party boss in Bengal, Mr Anil Biswas says Kolkata does not need any certificate from the leader of the Sangh Parivar, which has been engaged in dividing the country. And to Mr Pankaj Banerjee of the Trinamool Congress, Mr Advani is devoid of that sense which could rightly assess Kolkata’s beauty and importance. Deputy Prime Minister L.K. Advani along with other senior BJP leaders will take part in a ‘march towards village’ campaign beginning September 25 and aimed at strengthening the support of the party in rural areas. A party statement said BJP President M. Venkaiah Naidu, central ministers and Chief Ministers would take part in the ‘gaon chalo abhiyan’ to take the message of the party to villages across the country. The week-long campaign would start on the birth anniversary of Pandit Deen Dayal Upadhyay on September 25. The programme would serve as a bridge between the party, the government and the people, particularly in rural areas of the country. He first made headlines when as a crusading Municipal Commissioner in this city he took on politicians and builders and paid with his job. Mr Arun Bhatia, unceremoniously shunted out of the municipality to the Tribal Research and Training Institute, is back in the news — for blaming malnutrition for the death of 122 tribal children in Maharashtra’s Thane and Nandurbar districts. Irked by the institute’s reports, the Maharashtra Government has sought an explanation from Mr Bhatia. The government had ironically denied that malnutrition — an official euphemism for hunger — was responsible for the fatalities. In his reply to Chief Secretary V. Ranganathan, Mr Bhatia, the institute’s commissioner, said he stood by the reports and urged the state government to shed its ostrich-like attitude. The institute separately surveyed the deaths of 158 children belonging to 143 families this year in Nandurbar district. The sample in Thane was smaller — 26 deaths in 25 families. Mr Bhatia maintained that to say the deaths were not due to malnutrition was “absurd”. “Till the truth is not allowed to prevail, till malnutrition is not openly acknowledged as the main cause of death of children, effective anti-poverty remedies will not be considered and the death files will be closed after a few VIP visits,” Mr Bhatia said in his response. On the charge that he was contradicting the government, he sought to know under which rule a bureaucrat was meant to lie on issues like poverty and health. Mr Bhatia has always courted controversy. Within a week of becoming the Pune municipality’s commissioner in March, 1999, he cracked down on property tax defaulters and illegal constructions, angering several powerful politicians and builders. He was transferred in April, but was reinstated following a court order. Soon, however, the municipal councillors passed a no-confidence motion against him and he was shunted out. Incidentally, Mr Bhatia has been transferred 26 times in his 26-year career and, wherever he has gone, he has unearthed a scandal. The first report of the Tribal Research and Training Institute published on May 6 said the extent of malnutrition in 136 siblings of the deceased children of Nandurbar district was 76.5 per cent. Of these, 40 per cent were suffering from severe malnourishment. The second survey in Thane revealed that 92 per cent siblings of the deceased children were malnourished, 55 per cent of them severely. These conclusions, Mr Bhatia said, were derived from the weight-for-age measurements and criteria set by the Indian Academy of Paediatrics. 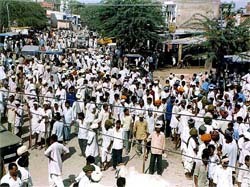 Rubbishing the government claim that the tribals had access to grain in fair price shops, Mr Bhatia said the “impoverished tribals” did not have the money to buy food. “In the past six months, 48 per cent of rice, 64 per cent of sugar, 92 per cent of wheat and 80 per cent of kerosene were not lifted by the families that had lost their children in Thane district,” he said. Ninetysix per cent families surveyed said they did not buy the quota they were entitled to because they did not have the money, Mr Bhatia said. Hans had alleged that the company was threatening him. In a statement issued here, Mr Bhushan Kumar, son of the late Gulshan Kumar, who was gunned down by members of an underworld gang, described the reports as “absolutely false”. In his statement he said, “Allegations are false and without any iota of truth and have been levelled with malafide intentions and ulterior motives to defame the managing director and the company”. The statement also reiterates that there is no controversy in view of written and duly signed documents signed by the singer and the entire amount of Rs 50,00,000 has already been paid in advance to Hans. The company also claimed that it was on Hans’ behest that the police started seizing genuine cassettes of his album, ‘Haye Sohniye’ in Jalandhar, Phagwara and Ludhiana. Though the police, on identification of dealers, had released the cassettes, the seizure memo had not been given to these dealers. A copy of the contract duly signed by the singer was also attached to the release.